Dan Mooney set out to refashion the city’s construction industry four years ago, just as the current building boom was getting underway. The 50-year-old crane operator and president of crane leasing company Vertikal Solutions was helping to build the 34-story Hilton Garden Inn in midtown. The concrete Gene Kaufman-designed building was nothing spectacular—drab compared with the glass-and-steel skyscrapers being built nearby. But with Mooney behind the controls of the Skypicker, a lightweight mobile crane he’d designed himself, the building went up in a relatively quick six months. After the Hilton job, contractors and developers started calling, eager to shave costs and accelerate construction of midsize towers. “As soon as I put that up,” Mooney said, “my phone went bonkers.” He rushed to have four more Skypickers built. After two deadly tower crane collapses in 2008 and a crawler crane collapse in February that killed a bystander, New York has been struggling with the risks and costs of using heavy machinery on city streets as the construction industry rides a boom in high-rise building. Mooney hoped the crane he’d invented would make skyscraper construction easier and safer. Most importantly, he hoped to provide an alternative to the high cost of using tower cranes, making smaller projects less expensive. Four years later, Mooney’s five Skypickers sit idle in an Astoria warehouse. After initially approving the Skypicker for use in New York City, the Department of Buildings reversed course, and with resistance from the union representing the city’s tower crane operators, the Skypicker has yet to get back in the game. “It was like Herod wanting to kill Jesus when he was 2,” Mooney said. The Skypicker is an unlikely rival to the construction cranes that dominate the city’s skyline. Compared with the tower cranes, whose metal lattices rise hundreds of feet into the air, the Skypicker looks underwhelming, even downright dinky. It’s only 10 feet tall with a 30-foot boom. That’s the point, says Mooney: The Skypicker can fit in small spaces and is ideal for midsize buildings where tower cranes are overkill and mobile cranes or derricks are not big enough. The city’s largest buildings still get built with tower cranes because only they, with their more than 15,000-pound carrying capacity, can lift the steel needed by skyscrapers like One World Trade Center and the Bank of America Tower. But since 2008, 39 buildings between 20 and 35 stories have broken ground, according to city data. These smaller towers are more often made of reinforced concrete—perfect for the three-ton lifting capability of a Skypicker. Tower cranes are used because developers have few other options, in part due to the efforts of a small group of specialized crane operators, for whom tower cranes and similar machines are the key to lucrative employment, even by New York City standards. METAL GIANTS: A crawler crane, left, is rolled onto a construction site and used to place objects from street level, while a tower crane is built up from the ground and use to lift materials. The International Union of Operating Engineers Local 14-14B lays out the wage floor for its operators at $73.91 per hour. That’s $150,000 a year before overtime, plus benefits equal to $32.50 an hour. When the operator is behind the controls of a tower crane, he gets a $2-an-hour bump. On weekends, when cranes are moved, pay doubles. With overtime, many union members earn half a million dollars a year. Moreover, rules regulating tower cranes mean the union can demand that developers hire additional workers on job sites, like master mechanics, relief crane operators and “oilers”—workers responsible for starting the cranes every morning. For decades, the local has had control over the training of new crane operators—and therefore who can work on a job site. That gives it an outsize role in deciding how and when new towers can be built. The Skypicker threatened to loosen that grip. Operating a tower crane requires a Class A license from the Department of Buildings. Getting the license requires training with someone who has one. For decades almost all the people with licenses have been members of Local 14. That effectively means that the only way to get a license is to join the union. New York’s construction industry is dominated by two types of cranes: tower cranes and crawlers. Dan Mooney wanted to break that duopoly with an innovative, lightweight crane. Mobile cranes on caterpillar tracks, crawler cranes have booms that can rise as high as 600 feet, and they’re cheaper to insure than tower cranes. Unlike tower cranes, they are not secured to a base and are less stable. Tower cranes can lift the steel girders needed in skyscrapers, but insurance is costly, raising them a few floors can take a half a day or more, and they require large, expensive union crews to operate. With a boom just 30 feet long and able to climb a floor in a few minutes, the Skypicker can haul up to three tons and requires only one person to operate. Mooney’s father, Joseph, a union member who spent 40 years in cranes, was a master mechanic on the Verrazano-Narrows Bridge construction. But Dan never joined Local 14. Instead, he earned his license training with a crane operator for Con Edison who belonged to a different union. Mooney struck out on his own, making hundreds of thousands of dollars a year at the controls of tower cranes and working on some of the biggest structures in the city. During the many hours of downtime on job sites, perched hundreds of feet above the street, he would pull out a journal and sketch new ideas for cranes, hoping to solve some of the machines’ fundamental problems. One feature of tower cranes that always worried him was the jump cycle—when the top of a tower crane is jacked up briefly on hydraulic lifts so a new section of steel tower can be secured to increase the machine’s height. It’s a delicate process that occurs dozens of times on a job site as a building gets taller, requiring intense focus and perfect weather conditions. “You can’t have a bad day,” Mooney said. Mooney’s solution took a telescoping boom that might normally be mounted on the back of a truck and placed it on a column that could run through a 16-inch hole set near the edge of the concrete floors of a new building. To move from one floor to the next, the crane is jacked up on hydraulics, then secured on the next floor with a collar. With the crane bolted to the floor, its boom hangs over the edge of a building and raises and lowers cargo from the street using steel cables. The original design was submitted to the Department of Buildings’ Cranes & Derricks division in 2011 and approved. In 2012, the city gave it the go-ahead to be used for building construction. “The proposed machine is essentially a mobile crane boom that will be structurally mounted within a building,” read the May 2012 letter. The crane was up and running atop the Hilton the next month. High labor costs are not the only reason why tower cranes are expensive. Richard Walker, an attorney for Kirkwood Insurance, said insurance premiums for a tower crane job can range from hundreds of thousands to over $1 million, even for modest projects. Location matters, as does the company’s accident history and revenue. After the 2008 collapses, premiums ballooned. The first collapse yielded 179 claims totaling $881 million in damages against the city of New York alone, the Daily News reported. Starting in 2011, the city forced all tower crane projects to carry at least $80 million in general liability insurance, a significant bump from the $10 million many had held before. A developer who used a Skypicker to put up a hotel downtown told Mooney that his premiums with a tower crane would have been between $1.8 million and $2.8 million for the 18-month job. Instead, insurance for the Skypicker was wrapped into the construction sites’ general liability coverage. Developers looking for alternatives to tower cranes have few options. After the 2008 collapses, contractors turned to crawler cranes—long, articulating booms mounted on tread or wheel platforms—because crawlers required only $25 million in coverage. “These are beautiful machines,” said Tom Auringer, a crane operator and the owner of U.S. Crane and Rigging. “But you can’t leave these on the street for weeks, months at a time.” The reason: because they’re not bolted down and are thus susceptible to high winds. In the city, building Class A office space costs about $300 per square foot. Tower cranes account for $20 of that. Mooney said his crane would contribute less than half that to the cost. For a 170,000-square-foot building like the Hilton, that’s a savings of about $1.7 million. Mooney says the Skypicker costs about $40,000 a month to rent and operate. A tower crane costs more than $100,000 per month before insurance and labor. Wages for the crane’s operators can be as high as $30,000 a month before other workers like riggers are figured in. On his first hotel job with the Skypicker, Mooney said, he was picketed by Local 14 operators. But otherwise, construction at the West 54th Street site continued without incident, according to Department of Buildings and 311 records. Having put more cranes into production at the Ohio-based crane manufacturer that built the original, Mooney soon had operators on four buildings in midtown and the financial district. Business was on the cusp of taking off. Mooney planned to manufacture 50-foot models to extend the crane’s reach. He was even tapped to be a part of Fastrac, a Bloomberg administration-era small-business incubator program that included classes on entrepreneurship. It looked as if he would soon recoup the $2.5 million he and his investors had sunk into the design and manufacture of the machines. Soon after his Skypickers went up throughout Manhattan, though, those work sites began getting anonymous 311 and Buildings Department complaints, which Mooney believed were coming from the crane operators union. Each time, he said, the inspectors were satisfied with the machines and left. A Local 14 representative would not directly address the anonymous complaints, saying only that the union wants to ensure all cranes are operated safely and according to Department of Buildings rules. When the Skypicker was first approved, Mooney was told his crane didn’t have to go through the long approval process required for newly designed large cranes and that it could be approved as a mobile crane. Those decisions let him quickly get the Skypicker into the field. But in the ensuing years, as the Bloomberg administration gave way to Mayor Bill de Blasio, leadership within the Department of Buildings changed, and the city reversed both positions. 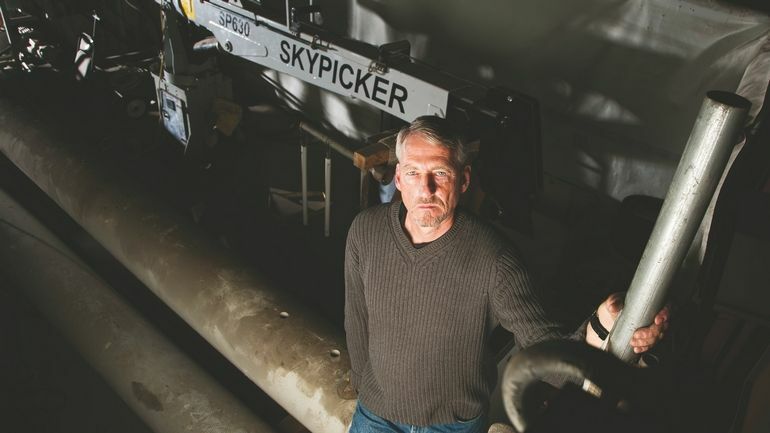 For the Skypicker to be used again, Mooney would have to start the approval process from scratch, this time checking off all the boxes normally marked for tower cranes, including creating new prototypes and scrapping the machines he’d already built. Mooney met with department officials to plead his case, but none of his allies in the agency were in the room. “The minute I walked into that meeting, I knew I’d lost,” Mooney said. He would be allowed to fin- ish the buildings he was working on if he solicited letters from the owners stating that they understood the crane would be used only for that job. Mooney completed his final building at the end of 2013, when the last Skypicker was packed off to the Astoria warehouse. Only then did the anonymous complaints end. Soon developers stopped knocking on his door. In April 2014, City Councilman Ben Kallos, who received $2,500 over two elections from Local 14, introduced new legislation to prohibit climber cranes like the Skypicker from being classified as mobile cranes. The rule would treat the Skypicker like a tower crane, requiring it to carry more insurance and have a Class A operator. Documents obtained by Crain’s under a Freedom of Information Law request show Local 14 received a draft of the bill from a Kallos aide before its introduction, specifically pointing out the climber crane exclusion. Kallos said the recommendation originated with the council’s legislative drafting unit and his office adopted it. “We rely heavily on drafters and our experts when crafting legislation,” he said. At the warehouse last month, Mooney leaned against one of the five Skypickers gathering dust. He doesn’t have the money to start over or to sue the city and appeal its decision. His best bet may be a new administration in 2017. Meanwhile, he is back to his old work. One of the first buildings Mooney worked on after the Skypicker was shelved was 33 Beekman St., a 34-story dorm for Pace University. The building sat next to a parking garage on a sliver of a street downtown. Mooney did it with a tower crane. The Skypicker would have made the job easier, faster and safer. A version of this article appears in the May 16, 2016, print issue of Crain’s New York Business as “Cheaper, faster, safer”.